As a foreigner, it has taken me a good ten years to really understand the importance of the local mayor and Mairie in France because we just do not have the equivalent in the UK. We knew that when we moved in to our village that we were supposed to introduce ourselves to our local mayor, which we duly did. When we were converting our barn, I became on first-name terms with him and he was so pro our renovation that he managed to fast-track our planning application through the official procedure. When all the parents in our small hamlet (14 houses) got together to sign a petition for the provision of some kind of lighting at the bottom of the hill for the children waiting in the dark for the school bus at 7am every morning, just three months later, a solar-powered light was duly installed. But it is the smaller, every day things that go unnoticed by the locals (who take such a service for granted) but which always amaze me, coming from a country where there is not much in the way of local decision-making anymore. 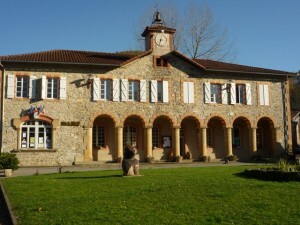 Hence, our Mairie employs two full-time people just to look after the commune. By that I mean, sweeping the roads, clipping the hedges and verges, clearing out the ditches and maintaining the lights, school flower boxes etc. Oh and clearing the roads of snow and ice in the winter – and this is a very rural community where houses are scattered up hills and along gravel track roads but this service happens without fail. It’s apparently the same for any problem in the commune – M. le Mayor is the first point of call and, if he can’t fix it, he will know somebody who can. France is hugely criticised on the world stage for its number of state employees and I think we all know that the costs of these have become untenable but I hope that it will be the legions of pen-pushers and paper shifters who go before these hard-working locals who really care about and have a reason to ensure that their communities are well looked after and just make life that bit nicer for everyone. « Is this a good time to buy French property?